The Altena Castle is a popular destination on the edge of Sauerland because of its short distance to the Ruhr area. Many of its visitors experience the Middle Ages for their first time when they see the impressive reconstruction built in Wilhelmian times. The historic reconstruction of the former ancestral seat of the Hohenzollern family had been designed a museum from the very start. Besides that, the world's first youth hostel opened up in the castle in the nineteen-twenties. 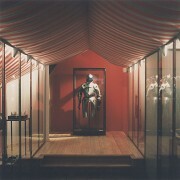 Since its installation in 1914, this was the first restyling and reorganization of the exhibition. All 34 rooms were rearranged and decorated in a completely new design. 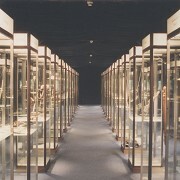 A special additive system of showcases was created which allows presentation in classic display cases as well as complete space installations. The main focus of the planning was, however, not to let the building as such disappear behind the future permanent exhibition. 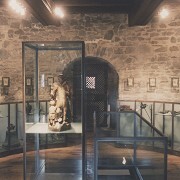 Only two of the rooms in which the architectural concept is not visible any more deviate from this principle and emphasize the exhibition with special wall and ceiling covering fabrics.